So many peaks and so little time! The Dorr North Ridge Trail is another north-south ridge hike that runs parallel with the Cadillac North Ridge Trail to reach the summit of Dorr Mountain, the slightly shorter companion peak to Cadillac Mountain. (The Gorge Path heads up the northern valley in between Cadillac and Dorr Mountains.) 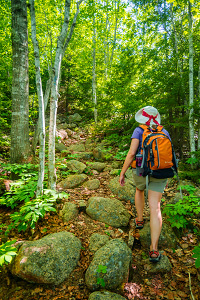 While the Dorr North Ridge Trail might not be the most unique or stunning hike in the park, it does offer up some idyllic Acadia scenery and peakbaggers will be able to check off the small Kebo Mountain in addition to Dorr Mountain. The Hemlock Trail and the Stratheden Trail offer an alternate return route back to the starting point. Access: Kebo Mountain Trailhead along the northern stretch of the Park Loop Road. 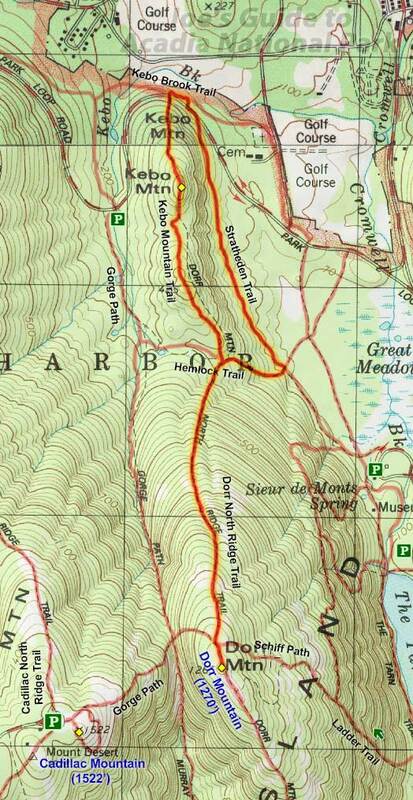 To get to the Kebo Mountain Trailhead from Bar Harbor, take Eagle Lake Road (Route 233) and then turn south on the Park Loop Road. Roughly half a mile south is the start of the one-way section of the loop road. Drive 1.4 miles on the one-way road (passing the prominent Cadillac North Ridge Trail and Gorge Path trailheads) and you will see the Kebo Mountain trailhead marker on the right (south) side of the road. There is no ideal parking at the Kebo Mountain trailhead, but .1 miles further down the road are a few roadside spots at the forested Stratheden Trail trailhead. Carefully walk the road or the Kebo Brook Trail connector back to the Kebo Mountain Trailhead. The hike up Kebo Mountain is short and easy; the trail heads up out of the lower forest to the top of the short summit, offering hints of a nice vista, but trees obscure the view. Continue down the south side of the mountain through the pleasant forested scenery to the junction with the Hemlock Trail and the Dorr North Ridge Trail. Now the real work begins! Head up the Dorr North Ridge Trail as it makes its steady ascent back out of the forest. 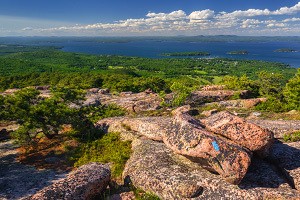 Several hundred feet up, you will clear the forest and will be walking on bare granite formations with wonderful views of Bar Harbor and the Porcupine Islands behind you. Near the top of the mountain, you will cross the trail junction to Cadillac Mountain and the Schiff Path. Continue .1 miles south to tag the actual Dorr Mountain summit marker. From the western cliffs of Dorr, you can get great views of the gorge below and Cadillac Mountain just across the way. This isn't the most exciting hike in the park, but I have never met a trail in Acadia that I didn't like. While the description here is for a simple in-out hike, there are many options for a longer and more strenuous loop hike that include the Gorge Path or even the Cadillac North Ridge Trail.